Home staging is necessary to sell your home, but we’ve got some helpful tips. Preparing to sell your home is a stressful process, but there are several things you can do along the way to make the process simpler. Home staging, even with the help of a professional stager, is one of the hardest parts. Here are 4 of our favorite home staging tips to make your home stand out from the rest on the block. The kitchen and bathroom are two of the rooms that buyers pay a lot of attention to. 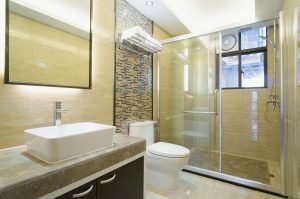 Are your bathroom walls dirty or grimy? Even if you do a good job keeping the rest of the room clean, that signals to prospective home buyers that you don’t take good care of the home or think that they should be cleaned up before having guests. Take the extra time to clean your bathroom walls and give them a fresh coat of paint if necessary. What colors are used in your master bathroom? Even if you are single and living alone, you should focus on home staging that makes your master bathroom a unisex place. Couples want to see that both people will be happy and singles want to see that they can easily customize the room to match their wants. Paint the bedroom walls a neutral color and choose a beautiful matching bedding. If you have dated kitchen cabinets that you don’t want to replace entirely because they’re in great shape, update them with a new stain or coat of paint. For less than a couple hundred dollars, you will have a totally updated kitchen for your home staging. The best way to attract random buyers who stop in to see how the inside of your home looks is with great curb appeal. Give your front door a brand new coat of paint or even consider repainting your siding in a gorgeous color to draw in new eyes. Even updated shutters can set your home apart without much money or effort. PLEASE JOIN US FOR OUR FREE DECORATIVE PAINTING, PLAY WITH PAINT event! April 4 from 11am – 5pm, snacks and refreshments will be provided. Come see the latest decorative paint trends for 2017 and learn valuable tips for getting easy and successful painting results. Come dressed to design and keep your own sample boards. This is an Open House format! We will be using techniques with non-tarnishing metallic paints, oxidizing metal paints, venetian plaster and metallic plaster. (443) 319-4001 and ask for Jamie or Faith.